BANGKOK, Thailand, June 15, 2011 (ENS) – Scores of people have died over the past week and 2,000 refugees have fled to the China border in heavy fighting around large hydropower dams being built in Burma’s northern Kachin state to provide power to China. Resistance to dam-building is the worst violence reported in Burma, also called Myanmar, since March, when the military regime bowed to a civilian government. “The root causes of social conflict in Burma have not been addressed and despite the formation of a new government, the country is still under the mismanagement of a military regime,” said Sai Sai, coordinator of the Burma Rivers Network, a Burmese river conservation group that represents ethnic minorities in dam-affected communities. “These mega-dams are fueling further conflict, not benefitting the people of Burma,” said Sai Sai. 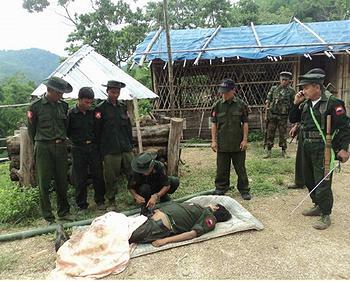 Breaking a 17-year ceasefire in the region, fighting erupted between the Burma Army and the Kachin Independence Organization, KIO, last week at the Dapein No. 1 and 2 dams. These dams on the Dapein River are being constructed by China’s state-owned Datang Company with other Chinese companies and the Myanmar Electric Power Enterprise. 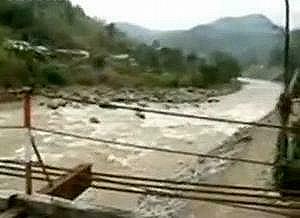 The government brought in hundreds of troops to secure the Dapein dams located near strategic KIO military bases, says the Burma Rivers Network. In Kachin State alone, nine giant dams are being planned or constructed by Chinese companies, including Myitsone, the first dam on Burma’s lifeline, the Irrawaddy River. Kachin News Group editor Lahpai Naw Din, who is based in Thailand, told Agence France Presse that Tuesday’s fighting marked the first day of “civil war” between the Kachin Independence Army and the Burmese military, with the KIA vowing to destroy any government infrastructure. The U.S. Campaign for Burma, a Washington, DC-based human rights organization, says Burma’s regime launched the offensive against KIA troops to exert control over the area nearby the Ta Pein River, where the dams are under construction. “Fighting continues until today with heavy casualties for the regime’s troops,” the U.S. group confirmed. Under bombardment with heavy artillery, KIA troops withdrew from their security post and destroyed three bridges to prevent the government from transporting soldiers further into KIA territory. Both sides have reinforced their troops and severe fighting is expected to continue, not only in Kachin State, but also in other ethnic states. In the first confirmation from the government side, an official said Wednesday that some bridges were destroyed in fighting in Kachin. Reports are coming out that Kachin villagers fleeing the fighting have been denied access to China, said U.S. Campaign for Burma Executive Director Aung Din. “It is pertinent that China open the border gate in Hp Yin Zhang (Yingjiang), Yunnan and provide protection and refuge to all villagers fleeing the fighting and allow humanitarian aid organizations access to the refugees,” Din said today. The fighting at the Dapein dams follows a recent public warning letter by the Kachin Independence Organization to China’s government that civil war may break out if construction of the Myitsone Dam proceeds. Repeated appeals from various sectors of society to halt the Myitsone Dam have been ignored. 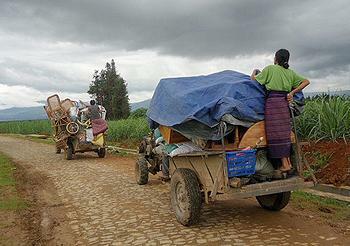 The fighting has now spread and clashes broke out Tuesday near the Shweli 1 Dam in northern Shan State. Also in Shan State, offensives against the Shan State Army-North near the Nong Pha Dam Site on the Salween River have caused thousands of people to flee their homes over the last three months, says the Burma Rivers Network. Last month, four Chinese dam technicians disappeared from the Tasang Dam site on the Salween. The government sent three battalions to the area to search for the technicians and provide additional security. In Karenni State, Light Infantry Battalion 423 of the Burma Army was brought in last week to secure the Ywathit Dam site, where a series of dams is also planned by China’s Datang Company on the Salween River and its tributaries. The Karenni armed resistance is active near the site and in December 2010 attacked a convoy of trucks transporting equipment to the dam construction site. Military authorities in Burma have ordered 8,000 people to move from their homes in preparation for a hydroelectric dam being constructed by European and Chinese companies that will power the country’s new capital of Nay Pyi Taw. The Upper Paunglaung Dam, located in Shan State 50 kilometers (30 miles) southeast of Nay Pyi Taw, will produce 140 megawatts of power and is nearly 60 percent finished. Swiss engineering firm Af Colenco has the construction design contract and is overseeing the project. London-based Malcom Dunstan Associates as well as Yunnan Machinery and Export Company are involved in the project. Kayan researchers report that the regional commander and township authorities have notified villagers they must be out by October and will receive just US$50 in compensation. “We are ordered to move out with threats but we don’t know where to go and how we will survive,” said a local villager interviewed for the report. “This project shows that whether from Europe or Asia, companies are willing to toss aside proper standards when working in Burma,” said Mu Moe Lay of the Kayan New Generation Youth.